Paint & Palette, by local artist Staci Hartman is off to a very good start. It has received numerous visitors in its first week and some of these visitors have already made repeat visits. An exciting aspect of this exhibition is that most of the works are for sale. The oil painting Country Roads was the first to sell so at the close of the exhibition, this beautiful painting will belong to another. Peaceful Waters has also been popular with viewers. It could have sold numerous times over, but this beautiful painting of a peaceful stream is not for sale. Staci painted Peaceful Waters from a photo taken at Rock Springs. 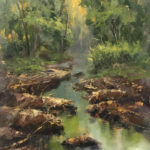 Rich earthen colors applied with deliciously broad brush strokes make the most enticing bank which beckons viewers to step up for a closer look at the reflection in the gently flowing stream. Skilled use of color and value adeptly reflect the surrounding trees and the dancing beams of sunlight that are slipping through their branches to seek reprieve in the quiet waters. Although, Peaceful Waters is not for sale, it is available for viewing until the 16th of July at the Dane G. Hansen Museum. The Hansen Museum’s Continuing Education Program is proud to have certified Bob Ross instructors, T.R. Mathews and Sandy Seamone of Arriba, Colorado, at the Museum on June 10th and 11th to teach Joy of Painting classes. Saturday’s class will paint “Desert Sunrise” and Sunday’s class will paint “The Cowboy.” T.R. and Sandy reveal with step-by-step demonstrations how easy and fun it is to paint using the Bob Ross method. Their tag-team approach to teaching keeps the classroom atmosphere light and entertaining. All painting supplies are provided and no previous experience is necessary. Young and old alike will enjoy the camaraderie of these classes. For more information, please call 785-689-4846.